In order to understand the impact wealth transfers can have on your current and future financial profile it is necessary to consider your lifetime wealth potential. news http://carminedimascio.com/tag/unit-testing/ Your lifetime wealth potential is the total of all the money you will ever earn, plus the interest that money will earn over your lifetime. If Steve & Mary could save their total household income each year, including the 2.0%* annual raise, add it to the $25,000 they currently have saved, and earn a 5.00%** annual rate of return, their lifetime wealth potential through age 65 would be $15,520,951. That’s over $15 million dollars. How is that possible? The table below may make it easier to understand. 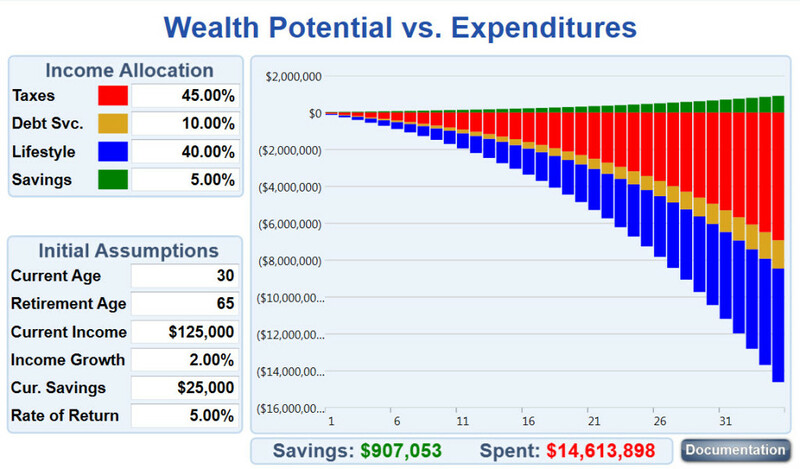 Steve & Mary’s lifetime income potential totals $6,249,310. Does that seem impossible? Not when you consider they earn $125,000 in year one, $127,500 in year two with a 2.0% raise ($125,000 x 2.0% = $2,500), $130,050 in year three with a 2.0% raise ($127,500 x 2.0% = $2,550), and so on for 35 years. The interest earned on their lifetime income potential is $9,246,641, and the total lifetime wealth potential is $15,520,951 ($25,000 + $6,249,310 + $9,246,641). This probably seems a little surreal. Stay with me a little longer and I will put this in perspective. For many Americans, taxes represent one of the biggest wealth transfers they will make. 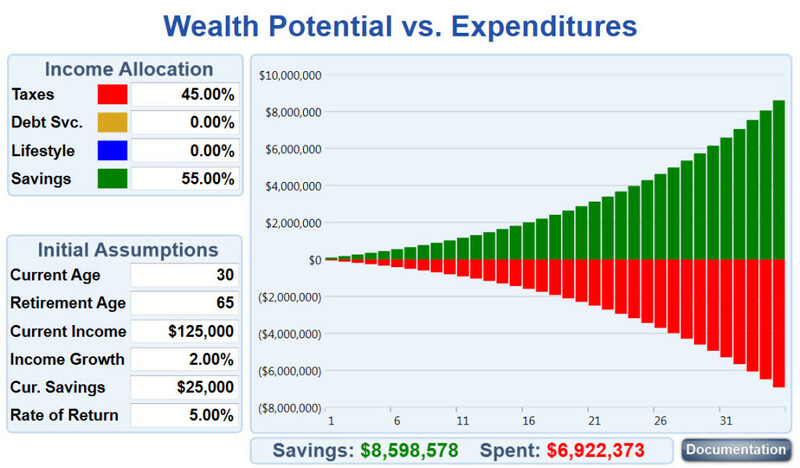 Let’s consider the impact taxes have on Steve & Mary’s lifetime wealth potential. When we consider all of the taxes Steve & Mary will pay, such as federal income tax, state income tax, Social Security, Medicare, sales tax, property tax, gasoline tax, vehicle registration fees, etc… about 45% of their income will go out the door in taxes. That represents $6,922,343 of their lifetime wealth potential, leaving them with $8,598,578 ($15,520,951 – $6,922,343). About $30 is missing as a result of rounding to the nearest dollar. Another major wealth transfer for Steve & Mary is the cost of housing. Like it or not, it costs a lot to live indoors. However, I believe housing is largely a lifestyle decision as opposed to an investment decision, so I’m going to include housing with the other expenses that make life more enjoyable, such as groceries, utilities, furniture, clothing, eating out, hobbies, etc… Lifestyle will account for about 40% of their lifetime wealth potential. That represents $6,153,220 of their lifetime wealth potential, leaving them with $2,445,358 ($8,598,578 – $6,153,220). About $30 is missing as a result of rounding to the nearest dollar. One final wealth transfer to consider is the cost to service the debt Steve & Mary will incur throughout their lives to pay for the things they cannot afford to pay for in cash. Debt service will account for at least 10% of their income. That represents $1,538,305 of their lifetime wealth potential, leaving them with just $907,053 ($2,445,358 – $1,538,305) of their original $15,520,951. About $30 is missing as a result of rounding to the nearest dollar. These examples demonstrate the incredible impact that wealth transfers can have on our financial lives. 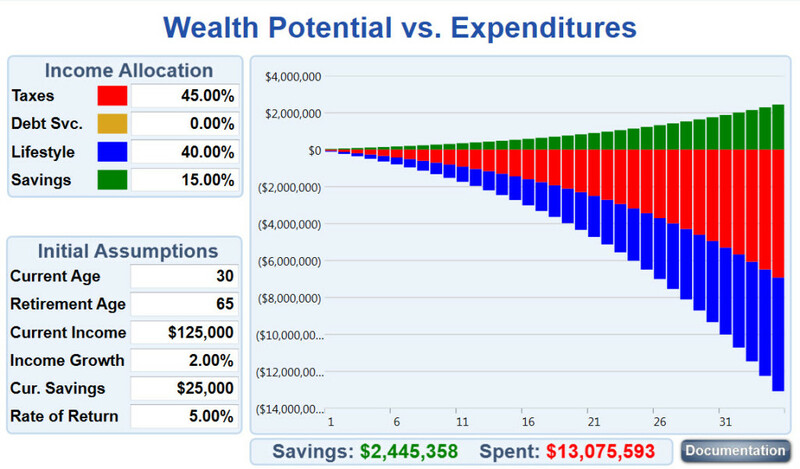 For Steve & Mary, wealth transfers ate up $14,613,898 of their lifetime wealth potential. While they probably enjoyed the ride, they don’t seem to have very much left considering what they started with. The greatest impact you can have on your monthly cash flow, as well as your overall financial profile, is to identify any wealth transfers you may be making unknowingly and unnecessarily and take steps to minimize or eliminate them. 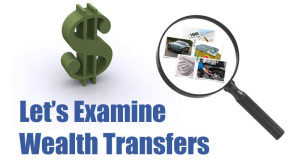 We are experts at identifying unintended wealth transfers. We routinely improve our client’s monthly cash flow by hundreds, and sometimes even thousands, of dollars per month by finding the not-so-obvious transfers and doing just that, minimize or eliminate them. If you would like us to help you identify the unintended wealth transfers that exist in your profile and devise a strategy and tactics to bring those dollars back under your control call us immediately to schedule a time to discuss your specific circumstances.